"Have you matched your interests with available opportunities?" Read through each story below. Try to work out whether the decision reached by the person is, or is not, a well-made decision. 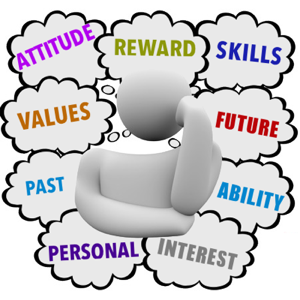 does the person know about themselves – their interests, abilities, personality, etc.? have they enough information about the options they are considering (work and study)? have they sought the advice of other people? is the person taking into account only present considerations, or are they thinking of the future? have they reached a decision themselves or have they been forced into it? what their friends think of their actions? the expectations of their parents? probably incorrect information which “someone” has told them? trouble with, or a dislike of, their present situation? little or no guidance from others? taking the “easy” way out? traditional stereotypes i.e. “that’s no job for a girl”? What advice would you give each person? What other study or work options might be open to them? DOREEN is beginning senior high school. She has an average ability, is quiet and conforming, and wants to be an actress. She has never been involved in any school drama presentation or been in any plays outside of school, but she is sticking to her dream. Her mother approves of Doreen’s choice and tells everyone that she is soon to be the mother of a famous actress. JANINE lives in a tough area where the Police Force is not very popular. Despite this, she decides that she wants to be a Policewoman. This makes her friends laugh and jeer at her, and she becomes the subject of many jokes. As Janine learns more about the job she is not so sure she would really like it, but after having caused such a stir, feels she must go ahead with her plans to save face. ALAN is 15, hates school, and is not very successful at anything, but he knows that he must finish junior high school if he wants to get any sort of decent job. One day he gets into a lot of trouble with his mates for fighting, and this is just about the last of Alan’s misbehaviour that the school is prepared to put up with. After a really big scene with his parents and teachers, Alan saves everyone the trouble of worrying about him and leaves school to look for work. JILL is a very able speaker and debater, and is an excellent student. For many years she has wanted to do a Law Degree. Her parents are concerned about her leaving home to go to uni as they don’t have enough money to support her, and yet they earn too much for Jill to receive enough money from AUSTUDY to support herself. Jill eventually decides to do the Arts Degree. STEVEN had always assumed that he would be an electrician because his father and two brothers had been. He didn’t bother to find out about any other jobs because he was sure of what he wanted. He had a job all lined up and was practically ready to start work when they asked him to go for a colour vision test. He had never known it, but he was colour blind, and that put an end to his chances of being an electrician. He was really angry and felt cheated by life. TRACEY thought that she was very lucky because as soon as she left school she had a job. There was no mucking around or joining queues, which was lucky for her as her marks and school reports weren’t really too good. She had never thought about what she should do when she left school, but when an offer came from her aunt, who worked in the catering business, to join her as a junior she just couldn’t refuse it. Anything would have to be better than school! JACQUELINE liked working with her hands and was always good at making things. She was also very good at drawing and designing things. She thought that a job in the printing industry would really suit her talents. Her parents thought that printing was no job for a girl, and became very angry and intolerant, telling her that banking or nursing would be far more suitable. Jackie talked to her careers adviser who agreed that printing would suit her talents, and they arranged a work experience placement for her at a local printery. She worked so well that she was offered an apprenticeship there when she left school. Her parents were very angry, and were convinced that it was just a stage she was going through, and by the time the end of the year came they will be able to change her mind. SARAH is a very able student who should be able to get into any university course she wants to. Her boyfriend Derek is a boilermaker and he wants to get married as soon as possible and buy a house and have some kids. Derek thinks it would be silly for Sarah to study because it would mean that she wasn’t earning any money… and what’s the point of a career if she is going to have kids?? Sarah loves Derek and after she accepts his proposal for marriage, she starts looking for a clerical job. EVAN was a sensitive, creative guy who liked children. His father was a butcher, running quite a successful business, and since Evan was his eldest son he had always assumed that he would also go into the trade. Evan wanted to be an infant’s school teacher. His parents just laughed and his father said that “that was woman’s work”. Realising how good his parents had been to him, and not wanting to get into a fight, Evan went along with his father and joined the butchery business. TOULA, the eldest of six children, was in her final year of school when her mother died. She performed well in her exams even though much of her time was devoted to home duties. She managed to gain admission to Accountancy at university, but was really unsure that she can cope with it and her responsibilities at home. She decides that part-time study, plus eight hours work per week at the local department store, is the best way for her to do things. It gives her a chance to get the qualifications, earn some pocket money, and look after her family, all at the same time. DAVID had completed high school and had been unemployed on and off for over six months. He answered a newspaper advertisement asking for an area sales representative to work for a big company. At the interview, David showed keen interest and was accepted for the position. The job required him to move 80 kilometres away from his home town. Practically the only thing he needed to do was to arrange accommodation. After the interview, he walked back to the local Job Search Office and was advised that they had a position as a driveway attendant at a local service station for him. Feeling that it was God’s will that a job in his home town had turned up, he accepted it. Since then however, David has again had several periods of unemployment, doing various casual jobs such as chicken plucking and leaflet distribution, and is currently employed at another service station on a part-time basis. MEGAN was a secretary and a very talented young lady, who wanted a career involved with writing. She was offered two jobs-one a straight high paid secretarial job, and the other a lesser paid Public Service job which offered prospects of working on a regular newsletter and journal. Much to the disapproval of her friends, she opted for the lesser paid job. BRIAN had always wanted to be a computer programmer. He has now got a job which he quite enjoys, even though the shift and weekend work are causing a few problems with his leisure time. His fiance, Joylene, doesn’t like Brian’s job because she hardly gets to see him, and she is pressuring him to change jobs. To keep her happy, Brian leaves his computer job and is horrified two months later when his darling Joylene drops him for someone else. DEAN went on to senior high school because everyone else did. When he got his first half yearly exam results he was very down hearted. He had heard that there were lots of jobs in the mining areas, so he left school and home and headed off to get one of these jobs. After spending most of his money to travel to the mining site he had heard about, he finds that there are no jobs for untrained, inexperienced people like him. What have you learnt from helping these people that might be able to help YOU make your decisions?